Currently, tankless water heaters are very high on demand. When it comes to performance, they are capable of giving you instant hot water anytime you want. They are available in varying sizes, and you can make a selection according to your convenience. So if you are looking for an endless supply of hot water, you should definitely consider installing this modern appliance in your house. They leave a very small physical footprint and are much more energy efficient when compared to their traditional counterparts. So it is also a great way of reducing your energy bills. Without any doubt, the tankless heaters have a number of advantages over the tank water heaters. This will be explained in the tankless water heater guide below. Which Tankless Water Heater Should I Buy? Who Makes the Best Tankless Water Heater? One of the main reasons to buy a tankless water heater is because they are capable of supplying an endless flow of hot water without consuming a lot of energy. They are capable of reducing the energy consumption by almost 50% when compared to the traditional water heaters. Other than supplying hot water, tankless water heaters can also be used for radiant floor heating. Interesting? Check out the said heaters here. These appliances come in very compact sizes and also do not take up a lot of space. Therefore, you can easily have them installed anywhere around the house. Furthermore, the replacement parts for these water heaters are easily available for purchase. So if anything goes wrong, you do not have to replace the whole thing. Hence, it can prove to be highly cost-effective in the long run. Tankless water heaters either run on gas or electricity. Both of these have their own pros and cons. Most households make use of gas-powered ones with electric ignition. It may be difficult to make a decision on which tankless water heater you should buy, especially when all seem to be doing the same job. However, if you want to make the best purchase, remember to consider the following key features. The flow rate is measured in GPM or Gallons per Minute. It indicates the amount of water that the tank can deliver when active. Each tankless water heater has its own minimum and maximum flow rate. Temperature rise is the value by which the temperature of the incoming water in raised before sending it out of the heater. It should be noted that the greater the temperature rise, the lesser will be the flow rate. This is because more time is required to increase the temperature of the water by a greater unit. It is very important to pay attention to the key features such as flow control, adjustments, safety locks and so on. This will determine the maneuverability of the heater on a day to day basis. Most often, the reputed brands have more convenient features and also higher build quality. To make it easier, you can have a list prepared well in advance so that you exactly know what features you want from your water heater. If you just want to use it in your kitchen, we recommend you to buy these heaters instead. The tankless water heaters can mainly be divided into three categories. These belong to the category of the earliest tankless water heaters. These heaters use highly reliable technologies and rarely have manufacturing issues. However, the disadvantage is that they have two hot exhausts that require the installation of expensive steel venting. They are also not as energy efficient as their counterparts. Furthermore, the efficiency of these heaters gets reduced when you use them on a frequent basis. The main difference between the non-condensing and the condensing tankless water heater is that the latter has a second heat exchanger installed in them. This means that the heat that would have otherwise gone thrown out of the exhaust will be used to heat the water further. This reduces the cost of operation and does not reduce its efficiency when used continuously for short draws. The unique feature of these heaters is that they feature a holding tank which acts as a hot water reservoir. This helps in increasing the efficiency of the heater when used for short draws. It also eliminates the issues that normally arise with pressure fluctuations. These are much more reliable as compared to the condensing and noncondensing tankless water heaters. As the demand for tankless water heater rises, more and more brands are coming out with their own innovative models. Listed below are some of the best brands for the tankless water heater. 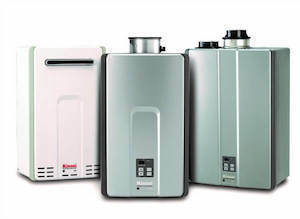 Rheem sells a very wide range of tankless water heater appliances. They use a versatile design, making their products applicable in a wide number of settings. If you are looking for the best electric tankless water heater, it is advisable that you go through the Rheem RTEX 13 electric water heater reviews and the Rheem rte 18 specs and reviews. You will find out that these appliances have a very stylish and compact finish and are up to 99.8% energy efficient. The heaters also have a digital temperature display for greater convenience. On the other hand, if you are looking for the best gas tankless water heater, check out the Rheem RTGH-95DVLN gas tankless water heater reviews. This tankless water heater has a highly energy efficient design and is equipped with plenty of safety features. Furthermore, they can be installed in multiple settings such as bathroom, dishwashers, washing machines, and so on. Ecosmart ECO 27 is another great option if you are staying in rather cold areas. 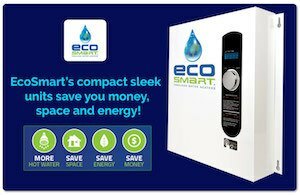 You can go through the Ecosmart ECO 27 electric tankless water heater reviews to understand the convenience of using this particular heater. It is capable of heating up to temperatures of 37 degrees at the rate of 3GPM even in the coldest of climates. When the temperature is moderate to warm, this goes up to 6 GPM. The good thing about Bosch is that they have both the electric as well as gas water heater reviews. The heaters are equipped with plenty of convenient features such as external temperature control, polymer encasing, built in flow sensors, stable output temperature and so on. You can check out the Bosch AE11 electric tankless water heater reviews and the Bosch 520 PN LP gas tankless water heater reviews for more details. Both have a thermal efficiency of up to 97% and are suitable for both residential and commercial applications. 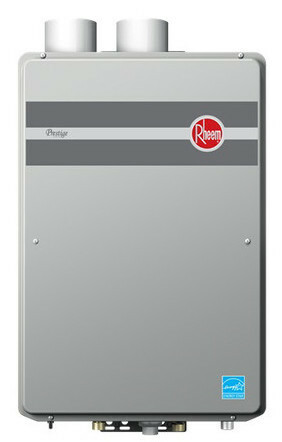 Rinnai is another one of the premium tankless water heater brands. 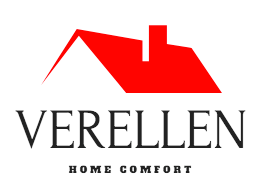 Their water heaters are made with premium grade components and feature a MC-91-1US Digital controller. They also have different temperature settings for the commercial and residential uses. Rinnai RL75iN gas tankless water heater have been very positive so far. 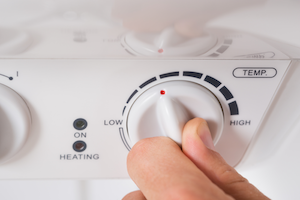 The appliance has a thermal efficiency of 82% can be a great way of saving up on your energy bills. Takagi is undoubtedly one of the most popular brands when it comes to a tankless water heater. The T-H3-DV-N gas tankless water heater is especially very convenient. It is equipped with computerized safety features and helps conserve energy. It is also compact and fits in almost everywhere. You can check out the Takagi T-H3-DV-N gas tankless water heater reviews for a better insight into its specs and features. If you are looking for something that offers an endless supply of hot water on instant demand, then you should probably check out the NPE240S-NG gas tankless water heater reviews. The water heater runs on gas and uses an innovative preheating technology. It also has efficient condensers and is field convertible. However, if you are opting for something from the low price category, make sure that you are well versed with knowing how to descale your tankless water heater. This way, you will be able to keep them running efficiently for a long time to come. These are the most common place to buy tankless water heater. They have variety types and choices for you to select from. Lastly, we hope our tankless water heater guide is able to help you with your buying decision. Tank Water Heater Vs Tankless Version: Which Is Better? 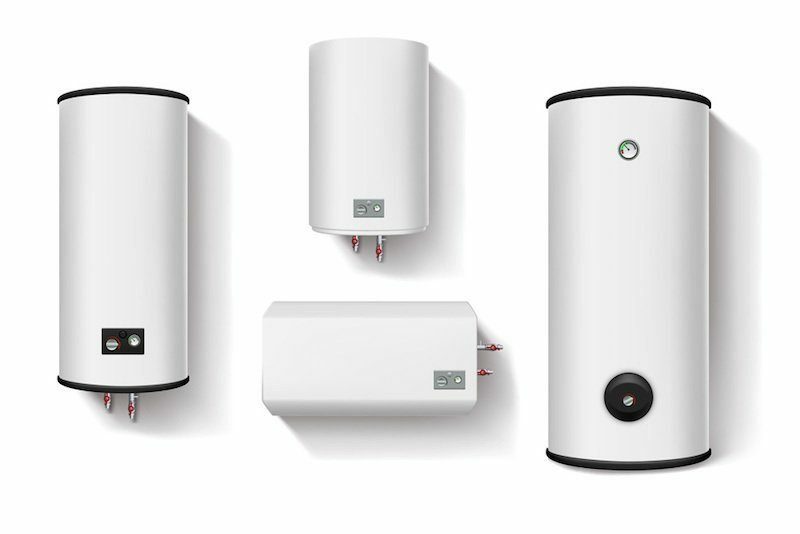 Are Tankless Water Heaters Worth It – Why Should You Invest in One? Why Is It Important to Descale Your Tankless Water Heater?